The inline pump article provides guidance and review about different types, qualities, durabilities, and prices. In this pump type, the suction and discharge connections are kept in a straight line or inline with each other inside of the casing. In-line pumps are centrifugal type pumps, and flow of fluid does not change inside the inline pumps. Mostly, the inline pumps are used for the water heating and circulation systems. They operate with water as the fluid medium and are called as the inline water pump. These pumps are smaller and require very less floor space. In-line pumps are not self-priming type pumps. They pump fluids with less or no solid particles mixed in them. They are used in the boiler, cooling tower, air conditioning systems, and as booster pumps in the water supply system. Due to their inline flow, they are easier to install. They can be installed like valves in pipelines. Inline pumps are commonly used as booster pumps in thermal power stations. In-line pumps must be selected considering the various factors affecting their performance and efficiency such as the follows. Type of pump – We must select the type of inline pump depending on their installation. The pumps are classified based on their shaft orientation as horizontal or vertical. Horizontal pumps operate only in limited pressure and temperature conditions. They are easy to install and maintain. Vertical pumps operate in high-temperature and high-pressure applications. Vertical inline pumps operate only when directly coupled to the motor. Horizontal pumps can be coupled to the engine, turbine or motor. In a horizontal pump, the motor cannot be installed below pump to avoid the fluid flow into bearings and motor assembly. No. of stages – they can be used as a single stage or multi-stage pump. Multi-stage pumps are used in booster applications for pressurizing the fluids. 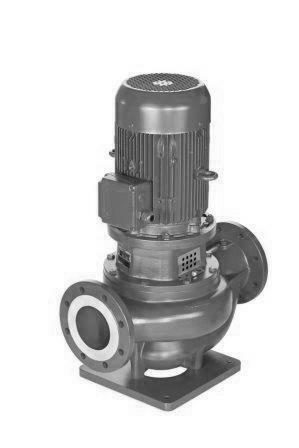 Single stage pumps are used in direct and low flow applications. They are compact in size. Flow rate – The amount of water or fluid that is being transferred by the pump. The flow rate is expressed in the terms of volume per unit time. The flow rate is measured in Gallons per minute (GPM). Power - the amount of energy required to transfer the fluid from the inlet side to discharge end. In-line pumps must be powered sufficiently to achieve the required flow rate and head. The power is expressed in terms of Horse power (HP). End flanges - End flanges must be suited for easier installation. Flanges are sized as per ANSI and API standards for standardization across the different brands. The end flanges must fit and align perfectly for effective pump performance. Low floor space requirements as both the suction and discharge are in inline. Simple piping design and pump can be suspended like a valve. Can operate without the seal in low-flow conditions. Cannot transfer the fluids mixed with the solid particles. Weight is not distributed in the pump and usually concentrated at a small place below the casing. Seal leakage accumulates at the top of casing and may lead to corrosion and erosion. In-line pumps are used in a wide variety of applications for residential, domestic and industrial applications. The primary manufacturers of the in-line pumps are Grundfos Inc., Rotech Pumps, TACO Comfort Solutions Ltd., Flowserve Corporation, Aurora Pumps and Castle Pumps. Their price ranges from 300$ to 1000$ for low flow and domestic applications. Their price may go up to 12000$ to 15000$ for the industrial applications and usage in thermal power plants. Grundfos Inc. is one of the leading pump manufacturers. They manufacture almost all kinds of pumps. Their In-line pumps have a flow range up to 20000GPM. Their pumps are used in both hot & cold water circulation, cooling tower, and various other industrial applications. TACO Comfort Solutions Ltd. manufacturers pump mainly for the residential and light industrial applications. There pumps are used in the circulation, air conditioning, livestock watering, laundering and cleaning applications.